I don't know where to begin. I downloaded SE, it crashed upon starting up the planetarium, so I tweaked a few settings per the troubleshooting guide, waited literally 30 minutes for the game to load, and then got the most amazing framerate ever: 50 seconds per frame. That's right! Fifty whole SPF, or 0.02 FPS. Of course, that may not be an accurate framerate as I only ever saw the first 2 frames. When I tried to drag the view with the mouse, the program hanged itself to death. My system is a Hewlett-Packard Pavilion dm4 laptop running Windows 7 Home Premium 64-bit with a mobile i5 CPU @ 2.3 GHz, 6 GB RAM and 1696 MB allocated video memory (but somehow actually 64 MB at the same time) on a pretty decent mobile Intel graphics unit. I don't expect top-notch performance, but considering that I can run Crysis at 30 FPS on medium, I would not expect such extreme lag. Any help would be appreciated. You running SE at Intel HD. You can't expect high performance on such hardware. Running Crysis at 30 FPS? This is just unbelievable. Are you sure you haven't gybrid graphics system with Intel HD + GeForce or Radeon? You may disable comets, aurora and atmospheres in the user.cfg before starting, because this is much hard effects. EDIT: disable nebulae also, those model in the background is very slow. Fly away from this place to Earth for example, and enable effects back. I am pretty sure I just have the Intel HD, no hybrid graphics. Crysis used a lot of "tricks" to increase performance, so I don't know if it is the best benchmark of GPU speed, I was just throwing that out there. After disabling comets, auroras, atmospheres, and nebulae, the load time went down to 2.5 minutes and the FPS went up to 6, sometimes 7. What settings would I have to change if I wanted 15-20 FPS, or even closer to 27 FPS? You could turn the LOD down, and make the window smaller, but there is only so much you can do with Intel graphics. 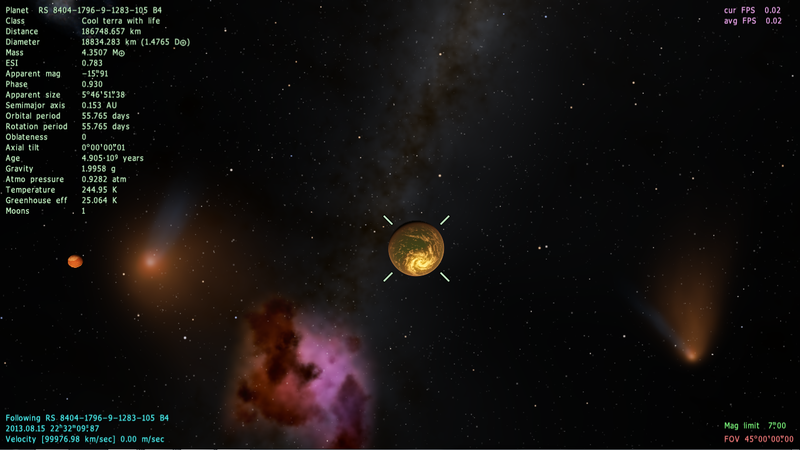 I changed the planet LOD settings in main.cfg from 5 to 2, but it didn't seem to affect the FPS in space. I then tried to zoom in on a planet and it hanged. No, not that, you should leave that at default. He meant change the LOD in the graphics settings, though it should already be at -2 by default. Anyway, the only way to get good performance out of SE is to use it on a computer with proper graphics hardware. It is not designed to be run on weak systems or ones with integrated graphics. Well, I changed the resolution to 640x480 and it didn't help the performance at all. I guess there is no Space Engine for me. Space Engine is a good pretext for upgrading your PC. I can't afford it, nor can anybody on fixed income/minimum wage (most of America). Anyways, I changed the star rendering mode to "point" and the FPS jumped up to 14, and I bet I can bring that number up even hgher. However, when I tried zooming in on a planet the on-the-fly loading hanged the program, just for 2 minutes at first, but then I got closer and it just kept loading and loading. Is there a way to disable this feature? Only by disabling planets. Otherwise your only option is to avoid them altogether. I see. It would be nice if there was a way to limit planet detail to a certain level as visible from space. I know that sort of defeats the purpose of Space Engine (at least half of it), but otherwise it's unusable. Try to update your drivers from Intel site. Intel added a lot of optimizations in latest version for opengl, and based on log you have an old driver. I already redownloaded SE, but no change.